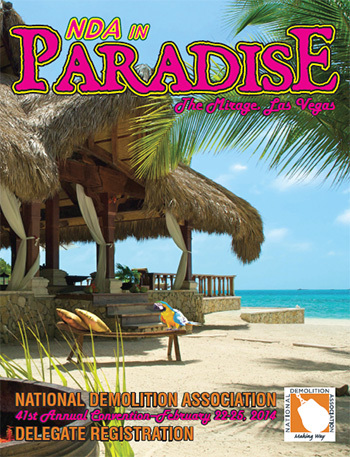 The deadline for registering through NDA headquarters in Doylestown, Pa., for the National Demolition Association’s 41st Annual Convention — at The Mirage, Feb. 22-25 — is today, Friday, Feb. 14. You can still register for the largest exposition of demolition equipment, products, and services in world by simply coming to The Mirage and visiting our Registration Area in the rotunda of the resort’s Exhibition Center. If you have any questions about the event or need additional information call 1-800-541-2412. One of the best reasons to attend this year’s 41st Annual Convention in Las Vegas is the keynote speaker. Nobel Prize winning physicist Dr. Stephen Chu, the former head of the U.S. Department of Energy, will be addressing the convention this year about the state of the global energy environment. Chu will be discussing how innovation and cooperation helped the United States address many of the challenges faced with the growing demand for energy resources. His presentation will deal with the successes that we have seen in the energy sector, the future challenges the U.S. and the rest of the world face, and how individual companies can implement some of the management tools developed by the DOE when dealing with complex problems. Kim Wieland, the NDA's new director of member services, will be discussing the dramatic changes that are taking place with the member services provided by the Association and how they are delivered on Tuesday morning, Feb. 25 at The Mirage. Wieland will be discussing the improvements being make to the NDA's website to improve access and user interface as we prepare the site for the implementation of the NDA's web-based health and safety training program and the development of the Body of Knowledge for the demolition process which will be accessible via www.demolitionassociation.com. Come learn how these improvements and a host of other innovations will make it easier to get the maximum benefit from the NDA. The U.S. Environmental Protection Agency has released its evaluation of the two largest beneficial uses of encapsulated coal combustion residuals (CCR or coal ash): For use in concrete as a substitute for portland cement, and the use of flue gas desulfurization gypsum as a substitute for mined gypsum in wallboard. Georgia Tech researchers have developed "self-healing" concrete and a way to monitor that healing process. Self-healing happens due to a combination of mechanical blocking by particles carried into a crack, along with the filling of the crack by calcium carbonate deposits, derived from hydration products within the concrete itself. Ohio Attorney General Mike DeWine has awarded more than $3.8 million in additional demolition grants to 87 Ohio counties. The additional grants were a reallocation of unrequested funds from the Ohio Attorney General’s Moving Ohio Forward Program. The ongoing expansion of green commercial real estate construction will be more apparent this year. Energy efficient homes will become the norm, inundating the real estate industry like never before. The growing stress to build energy efficient homes will obviously have a telling effect on the demand of energy efficient building materials. Here are the six cutting edge building materials that will remain in-demand in 2014. An Arizona civil engineering firm has taken a huge step into the future of surveying and design. Civil Design and Engineering was one of the first in Flagstaff to use GPS in its work, and about six months ago, it purchased a set of LiDAR surveying instruments that can create 3-D images of buildings, landscapes and even accident scenes. If you're a manager, who do you want on your team — a bunch of whiners who moan and groan about everything little change or challenge, or the winners who know what they have to do and are willing to meet every obstacle as an opportunity? Of course, you'll say you want the winners, but I bet you have a few whiners on your team right now anyway. If you are wondering how you ended up with a team of both winners and whiners when you used the same methods to interview and hire everyone, you may have made a common, but understandable, tactical error. Ohio Attorney General Mike DeWine has awarded more than $3.8 million in additional demolition grants to 87 Ohio counties. The use of asbestos has a long history. Asbestos has been used for more than 2,000 years, called by the ancient Greeks "inextinguishable," because of superior resistance to fire. In a process that's going to be drawn out over a series of months, the Metrodome went through another stage of its demolition when crews rigged explosives to the Dome's roof support structure and promptly blew it up. The House approved a yearlong suspension of the nation's debt limit in a vote that left Republicans once again ceding control to Democrats after a collapse in support for an earlier proposal advanced by Speaker John A. Boehner, R-Ohio. In a narrow vote, just 28 Republicans joined nearly all Democrats to approve a "clean" extension of the government's borrowing authority — one without strings attached.